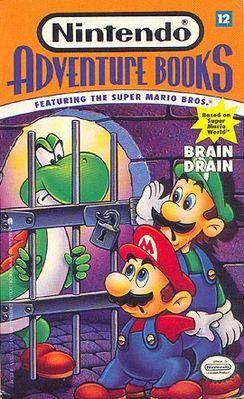 Brain Drain is the twelfth and final book in the Nintendo Adventure Books series. Evil Iggy Koopa has created a device to switch the brains of the creatures in the Mushroom Worlds. When he gives Yoshi the brain of a sinister Koopaling, Mario and Luigi jump into action. With the help of Dr. Sigmund Shrinkasaurus, they try to stop Iggy before all of their friends in Dinosaur Land lose their heads! As in all Nintendo Adventure Books, you control the action. Only you can make the choices that allow Mario and Luigi to halt the chaos caused by Iggy Koopa's brain twister machine. Help them crack codes, solve puzzles, conquer mazes, and subdue enemies. You and the Super Mario Bros. must outwit a whole new generation of Koopa creeps- or go down in final defeat. An unidentified piece of paper is shown as well but never collected. Presumably it is the "Plumber's Oath" that Mario has Luigi memorize so they can identify each other no matter what bodies they're in. An unidentified Koopaling (possibly Morton) also switches minds with Yoshi at the beginning of the book. This page was last edited on August 22, 2018, at 19:30.